Many species of British mammals have undergone a dramatic decline in distribution and population size during this century. For example, the red squirrel is almost extinct in Yorkshire as a result of the spread of the American grey squirrel. Likewise, no traces of dormice were found in the county during the 1993 nationwide "Great Nut Hunt". Numbers of our commonest bat, the pipistrelle, fell by 60% between 1978 and 1986. 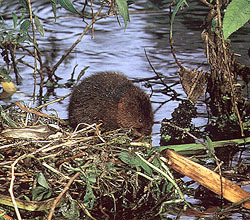 95% of the water vole population in Yorkshire has been lost in the last decade. The reasons for these population crashes are varied but often hinge on habitat fragmentation isolating remaining populations and changes in forestry and agricultural practices. At the same time other mammal species are increasing their ranges (e.g. roe and muntjac deer), bringing them increasingly into conflict with humans. It is only by regular monitoring and continued basic research that these changes in our mammalian fauna can be detected and more fully understood. The YMG plays a full part in national surveys and has undertaken a number of its own research projects (e.g. water shrews). The YMG was also recently involved in a dormouse reintroduction programme that was undertaken in North Yorkshire.